This section contains examples on how to place a custom local task (menu tab) link within your app. Alternatively, you can create your own custom local task set. Remember, that the View local task is provided by DrupalGap core, so we're going to group our local task with it. Did you notice the Edit button is not there? That's because in this particular screen shot the user does not have permission to edit the node, so the Edit local task is automatically hidden. 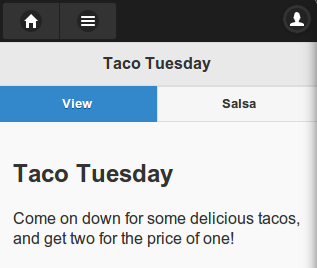 Now if someone were to visit any article that has the word "Taco" or "taco" in it, there would be a local task placed on the page called Salsa. When it is clicked, the node id will be fed into our page_callback function. We could then use that node id as a contextual filter with a View to retrieve whatever data we need. Say for example we wanted to place an Articles local task (menu tab link) across the tops of the user account pages. When the tab is clicked, we want it to a show a page with a list of the user's articles. We also want the title of the page (e.g. 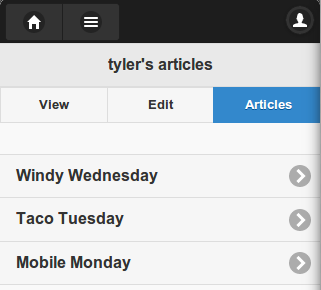 "tyler's articles") to be dynamic, in that it responds to the context of the user account. Additionally, for this example we'd like the local task only to show up when viewing administrator accounts. Notice we used MENU_LOCAL_TASK for the type, this is because the MENU_DEFAULT_LOCAL_TASK is already specified by DrupalGap core, so we're just adding to this set of local task menu tabs. Notice how we appended an underscore and the uid to the Views Render Array id? This is because as we navigate through the app and view different user profiles, we need a unique id for each widget. Feel free to adjust your titles and access controls as needed.